Home of the 2011, 2012 and 2017 Land O' Lakes Grand Champions! 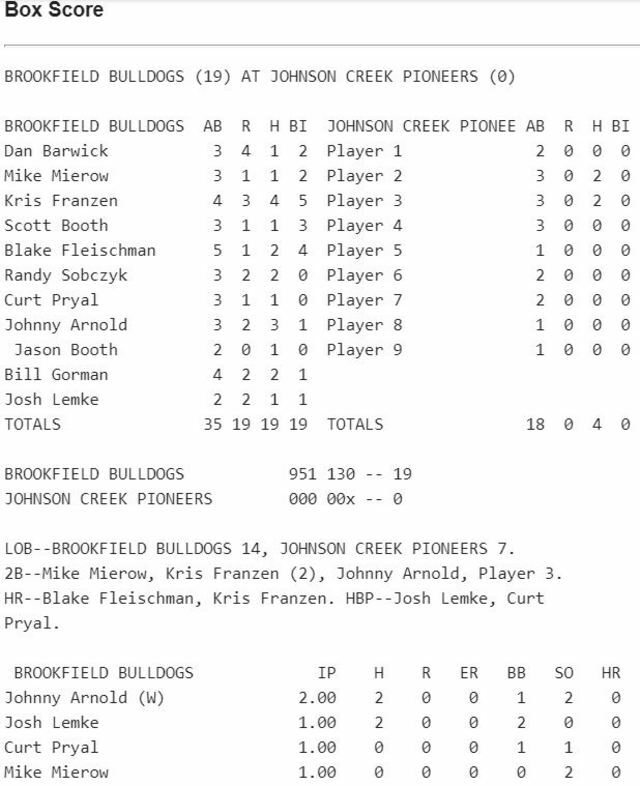 Bulldogs in midseason form with a 19-0 win in 5 innings over Johnson Creek. Johnny Anthony Arnold with the win on the hill. 29 pitches in 2 innings, 20 of which went for strikes. He also picked up where he left off last season, going a perfect 3-for-3 at the plate. Kris Franzen had a monster day at the play, going 4-for-4 with a bomb that ended up in the river well past the right field wall. Franzen had 5 RBI and 3 runs scored. Blake Fleischman, a Whitewater Warhawks alumn, joined the Bulldogs in style with 2 hits, including a homerun and just barely missed another. Blake finished with 4 RBI. Bill Gorman and Randy Sobczyk each had 2 hits. Players that had 1 hit included Dan Barwick, Mike Mierow, Scott Booth, Curt Pryal, Josh Lemke and Jason Booth. Lemke, Pryal and Mierow each pitched a scoreless inning. Special thanks to Sheena Selin and Bill Gorman Sr for supporting the team today. The Bulldogs take on a good Hustisford Astros team next Saturday at 1:00 pm. The Bulldogs have accepted an invite to play in the 2019 Wisconsin Amateur Baseball Association Classic Tournament. Participating teams include the Appleton Legends, Aztec Jaguars, Brookfield Bulldogs, Burlington Barons, Chicago Rippers, Clyman Canners, Everest Merchants, Hartford Hawks, Kewaskum A's, Milwaukee Beavers, Sheboygan A's, Sparta Miller, Sussex Cardinals, West Bend 7 Up, Windfall Lake Loons and the Windy City Prospects.